amla Indian recipes. 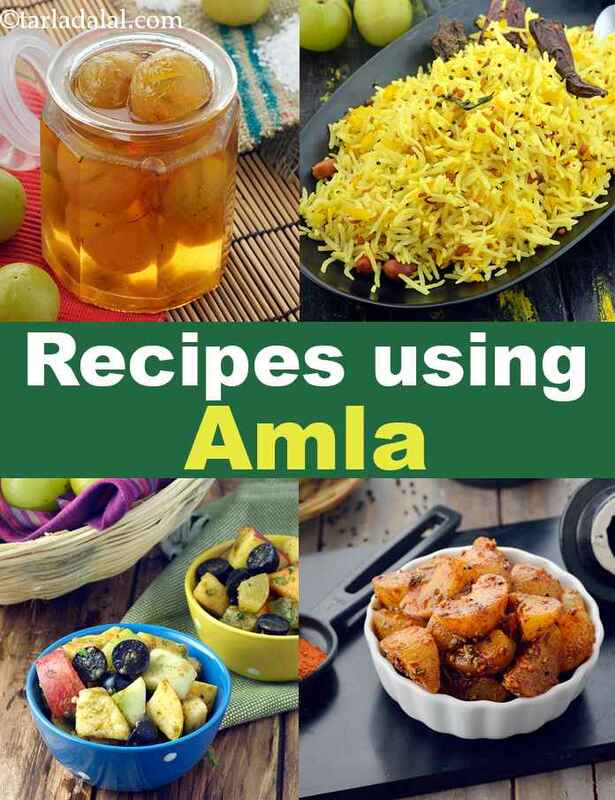 amla recipe collection. Amla, also called as Indian Gooseberry, is a fruit that is native to India. It is yellowish in color, round in shape with vertical stripes over it and a very unique and distinctive sour taste that you don’t get from anywhere else. The sour taste doesn’t make it any less popular and is still used extensively in food. Apart from culinary usage, it is also a part of traditional medicine due to certain qualities. It is used to treat indigestion, hair loss and also inflammation. Hands down the most famous recipe made with amlas is the Rajasthani Amla Murabba. This is essentially pickled amla in sugar syrup till they are candied and give the perfect balance of sweet and sour. This recipe is mostly made in the winters as amlas are most available then. It takes a long time to make, approximately 3 days, but is definitely worth the wait to eat this post meal snack. It is served along with Khamiri rotis and other parathas. Another way to go is the Spicy Amla Pickle. This is a stark contrast to the murabba which is sweet. Here the amlas are boiled and then marinated in a mix of different aromatics and seeds and then stored for a long period of time. There are many other types of amla pickles that are made all over the country in different states. Amla has been used as a part of traditional medicine since centuries now. It has a high content of Vitamin C which is great for the immune system of the body, it serves as an antibacterial and also has a cooling effect on your body. Amla juice, a simple decoction of amla and water, is a power house of vitamin C and helps boost immunity. Because it is very tart in taste, you can have it with a little bit of honey to make it taste better. Amla is added to different types of vegetable juices to add a little flavor to them. For example adding just a little bit to Palak, kale and apple juice or to Carrot and orange juice, really lifts the flavor of the whole thing to make it better. Another way to add it to your health quotient is by combining many different fruits together to make an ultimate Fruit Chaat. This is honestly the best of both worlds as it combines the juicy fruits with jeera and rock salt in this ultimate snack. If you want to know more about the Uses of Amla, then you can check out our article on that. Enjoy our amla Indian recipes given below. Amla Chutney is a chatpata accompaniment with a mind-boggling flavour that combines tang, spice and more! This easy-to-make chutney combines gooseberries with ingredients like green chillies, ginger and coriander, which balance the tartness of amla beautifully. Fruits and veggies boost one's immunity as they are rich in natural antioxidants, vitamins a and c. Cooking destroys these vitamins, and so it is better to have them raw as in this recipe. A fresh and refreshing drink!! refrigeration should be avoided as the flavours are lost. The juice can be put in a bottle and preserved in the refridgerator, and used as a health drink by adding little water. Amla raita is a rich source of vitamin c. Children who do not enjoy amla will enjoy this raita along with hot phulkas or rotis. You can add cardamom powder and few saffron strands too.it is good for health,hair,used as a substitute for chavan prash too. A quick method to get relief from cold. It's easy and delicious snack. . . Can be served with any chutney. Amla is a rich source of vitamin c. In winters amla is available in plenty. Amla ki launji is moderately spicy and unlike pickle, you an eat it in more quantity thus enjoying the benefits of amla.